"I Don't Want To Get In That !" 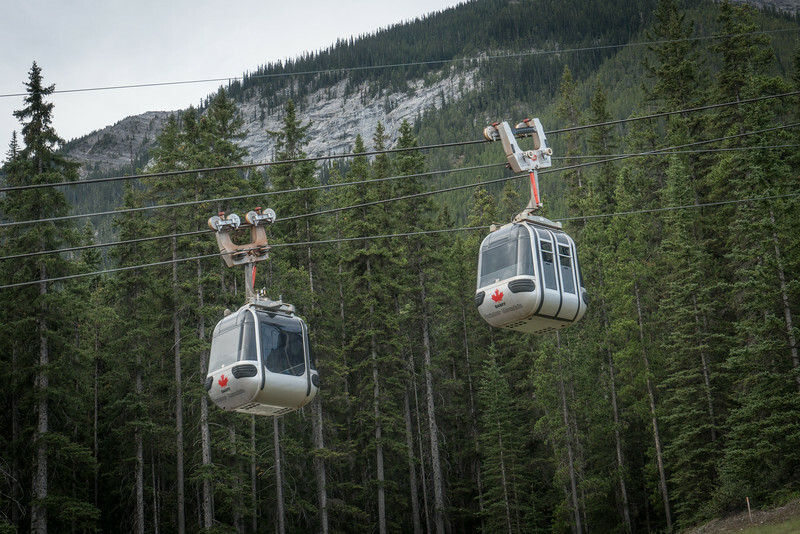 Early one morning while in Banff, the agenda called for a "gondola ride on some mountain". It didn't seem like a good idea to me when I read the agenda, but it passed. The morning we pulled up to the gondola it came back to me. I'm not a big fan of heights. Once I saw these, I was looking for an exit strategy from the rest of the group to avoid going up the mountain. I of course came up with nothing, and off we went. Of the four of us in the gondola, two like the ride (Erika Wales and Phil Yurgae - fresh off their helicopter ride the day before) and two of us (me and Rosie Yurgae) thought there were better ways to spend our time, but we were trapped. Rosie and I sat backwards in the gondolas so we didn't have much to look at.